Here is Step by Step Guide For Installing Powerline on OS X 10.10 (Yosemite) Including Managing the Python Path From Oh My ZSH dot File. Previously, we summarized how to install iTerm2, Homebrew and ZSH on OS X 10.8, for natural reason; some stuffs might give error if you try to install Powerline. OS X by default is shipped with own versions of some UNIX softwares including Python. You should not try to uninstall them. OS X Python is located at for Global usage, Homebrew Python will get install at /usr/local/lib/. The most important step is to run brew linkapps python command. ## needed for powerline starts source /usr/local/lib/python2.7/site-packages/powerline/bindings/zsh/powerline.zsh export PATH=/usr/local/bin:$PATH # for Python launchctl setenv PATH $PATH ## needed for powerline ends # sample zsh config ZSH=$HOME/.oh-my-zsh # zsh theme ZSH_THEME="robbyrussell" export UPDATE_ZSH_DAYS=10 COMPLETION_WAITING_DOTS="true" # zsh plugin plugins=(git colored-man colorize github jira vagrant virtualenv pip python brew osx zsh-syntax-highlighting cake git-flow git-extras npm node theme web-search battery) source $ZSH/oh-my-zsh.sh # go export CC=clang GOPATH=/usr/local/bin/go GOROOT=/usr/local/bin source /Users/abhishekghosh/.iterm2_shell_integration.zsh # Ruby export PATH="$PATH:$HOME/.rvm/bin"
Add the lines missing to .zshrc, but do not source it. If you face problem in the next steps, that is usually due to error in the above setup. It is really painful to fix, last option is re-installing Homebrew when Python gets fully abnormal – which python is returning /usr/local/bin/python but running pip install is installing stuffs on System Python’s path. Do not try to remove the System’s OS X related Python. Do whatever with Homebrew. We hope that you have updated Xcode command line tools. If you work in this way, in future it is unlikely that you will ever call us bad names after learning vi, in case you are not mastered vim yet. We have no .vimrc file. We need no such. We added the needed lines on .zshrc before. If you dislike Powerline or want to “pause” usage, then uncomment the source /usr/local/lib/python...zsh/powerline.zsh line and source the .zshrc. 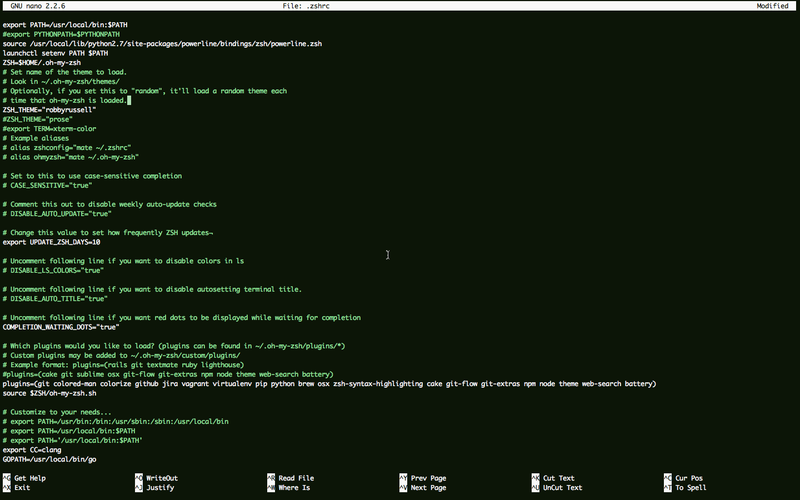 The text editor shown in screenshot is using our nano syntax highlighting repo. Whether you’ll use tmux or vi; this is not possible to predict. This is the basic setup. This Article Has Been Shared 9809 Times! CakeBrew is a nice free software for managing packages of HomeBrew Package Manager from a Graphical User Interface (GUI). Here is details. If Your OS X Yosemite Installation Stuck at Minutes Remaining, You Should Check the Log and Fix It Accordingly. Read This Guide To Get Helped. Here is a hard OS X Yosemite Review pointing the importance of Steve Jobs absence. Apple forgot the premium clients using Mac Pro and MacBook Pro. If you want to use OS X in a kind of Linux or BSD way, there is way to become the root user. This guide is intended for the advanced users. Cite this article as: Abhishek Ghosh, "Installing Powerline on OS X 10.10 (Yosemite)," in The Customize Windows, April 14, 2015, April 21, 2019, https://thecustomizewindows.com/2015/04/installing-powerline-on-os-x-10-10-yosemite/.